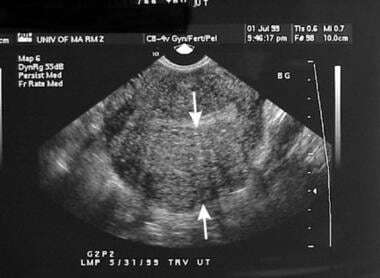 Transvaginal sonogram of an enlarged uterus with a thickened posterior myometrium (arrows). 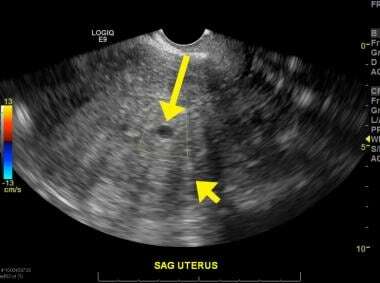 Sagittal transabdominal sonogram of an enlarged uterus with a thickened posterior myometrium (arrows). Sagittal magnetic resonance image of an enlarged uterus with a thickened posterior myometrium. T2-weighted image without gadolinium enhancement shows a widened junctional zone of 23 mm (arrows) and focal high signal intensity (arrowhead). Same patient as in Images 1 and 2. Transvaginal sagittal image of the uterus showing indistinct endometrial lining (long yellow arrow) with subcentimeter avascular cyst abutting the posterior endometrial lining (short yellow arrow). Courtesy of Christopher D Scheirey, MD. 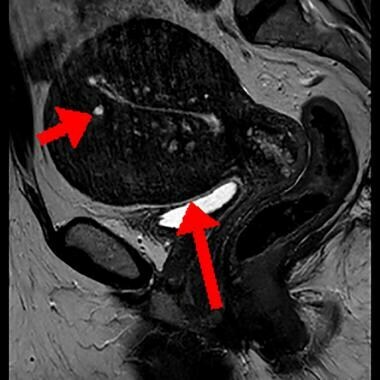 Sagittal T2-weighted MRI image (same patient as in previous image) without IV contrast showing a globular hypertrophied uterus (long red arrow) and tiny fluid collection about the endometrial lining, with the short red arrow pointing to the largest one. Courtesy of Christopher D Scheirey, MD. Thin-section, high-resolution MRI scans obtained with a pelvic multicoil array are optimal for diagnosing adenomyosis. The uterine zonal anatomy is best seen on T2-weighted images. Variations in the normal thickness of the inner myometrium, or junctional zone, have been reported, with a mean thickness of 2-8 mm. Widening of this junctional zone has been associated with adenomyosis (see the image below). Furthermore, the thickness of a normal junctional zone changes with the menstrual cycle, while the thickness of diffuse adenomyosis does not. The bright foci seen in the myometrium on T2-weighted images in 50% of patients are islands of heterotopic endometrial tissue, cystic dilation of heterotopic glands, or hemorrhage. Whether the hemorrhage is from hormonal changes or from spontaneous causes is not known. Sometimes, linear striations of decreased signal intensity can be seen radiating out from the endometrium into the myometrium on T2-weighted images. These striations are the direct invasion of the basal endometrium into the myometrium. When the striations blend or become indistinct, pseudo-widening of the endometrium is seen. Focal adenomyosis, as opposed to diffuse adenomyosis, is seen as a localized, low–signal-intensity mass within the myometrium on both T2-weighted and contrast-enhanced T1-weighted MRIs. In one series of T1-weighted images, most of these masses were isointense relative to the surrounding myometrium. These focal adenomyomas were 2-7 cm in diameter, round or oval, and located in the posterior wall. They also had a poorly defined margin. The most common lesion of adenomyosis seen on MRI is a low–signal-intensity area on T2-weighted images that often gives the appearance of diffuse or focal widening of the junctional zone. This hypointense area is smooth-muscle hyperplasia accompanying the heterotopic endometrial glands. Rarely, endometrial carcinoma may arise from adenomyosis. It has been shown that when adenomyosis coexists with endometrial carcinoma at the same site on T2-weighted images, contrast-enhanced T1-weighted images improve the accuracy of staging. Gadolinium contrast enhancement does not aid in the diagnosis of diffuse adenomyosis. Endovaginal ultrasonography, especially with a Doppler technique, can be used as the initial imaging modality to determine the presence of adenomyosis. It must be performed meticulously and with real-time imaging. Chiang and colleagues used color Doppler ultrasonography with the morphologic criteria to improve the diagnostic accuracy of ultrasonography in differentiating adenomyosis from leiomyomas. They found that 87% of the cases of adenomyosis had randomly scattered vessels or intratumoral signals. In 88% of leiomyoma cases, they observed peripheral scattered vessels or outer feeding vessels. In addition, in 82% of the adenomyomas, arteries within or around the uterine tumors had a pulsatility index (PI) greater than 1.17, and 84% of leiomyomas had a PI of 1.17 or less. What is the preferred imaging for the diagnosis of adenomyosis? What is the role of MRI in the diagnosis of adenomyosis? What are parameters for the diagnosis of adenomyosis by transvaginal ultrasonography? What is the role of ultrasonography in the diagnosis of adenomyosis? Cunningham RK, Horrow MM, Smith RJ, Springer J. Adenomyosis: A Sonographic Diagnosis. Radiographics. September - October 2018. 38:1576-1589. [Full Text]. [Guideline] Van den Bosch T, Dueholm M, Leone FP, Valentin L, Rasmussen CK, Votino A, et al. Terms, definitions and measurements to describe sonographic features of myometrium and uterine masses: a consensus opinion from the Morphological Uterus Sonographic Assessment (MUSA) group. Ultrasound Obstet Gynecol. 2015 Sep. 46 (3):284-98. [Medline]. [Full Text]. Agostinho L, Cruz R, Osório F, Alves J, Setúbal A, Guerra A. MRI for adenomyosis: a pictorial review. Insights Imaging. 2017 Dec. 8 (6):549-556. [Medline]. [Full Text]. Struble J, Reid S, Bedaiwy MA. Adenomyosis: A Clinical Review of a Challenging Gynecologic Condition. J Minim Invasive Gynecol. 2016 Feb 1. 23 (2):164-85. [Medline]. 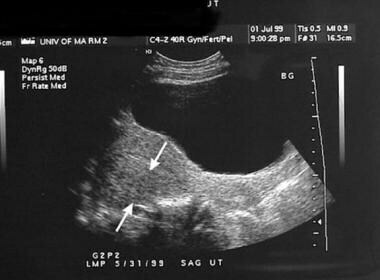 Sakhel K, Abuhamad A. Sonography of adenomyosis. J Ultrasound Med. 2012 May. 31(5):805-8. [Medline]. Sharma K, Bora MK, Venkatesh BP, Barman P, Roy SK, Jayagurunathan U, et al. Role of 3D Ultrasound and Doppler in Differentiating Clinically Suspected Cases of Leiomyoma and Adenomyosis of Uterus. J Clin Diagn Res. 2015 Apr. 9 (4):QC08-12. [Medline]. Krentel H, Cezar C, Becker S, Di Spiezio Sardo A, Tanos V, Wallwiener M, et al. From Clinical Symptoms to MR Imaging: Diagnostic Steps in Adenomyosis. Biomed Res Int. 2017. 2017:1514029. [Medline]. [Full Text]. Mansouri R, Santos XM, Bercaw-Pratt JL, Dietrich JE. 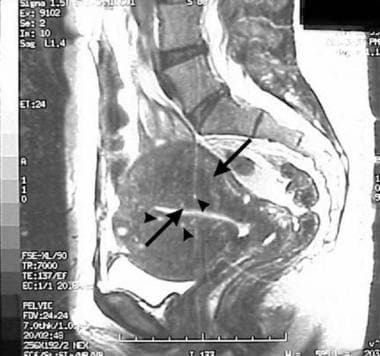 Regression of Adenomyosis on Magnetic Resonance Imaging after a Course of Hormonal Suppression in Adolescents: A Case Series. J Pediatr Adolesc Gynecol. 2014 Dec 29. [Medline]. Leyendecker G, Bilgicyildirim A, Inacker M, Stalf T, Huppert P, Mall G, et al. Adenomyosis and endometriosis. Re-visiting their association and further insights into the mechanisms of auto-traumatisation. An MRI study. Arch Gynecol Obstet. 2015 Apr. 291 (4):917-32. [Medline]. [Guideline] Expert Panel on Women’s Imaging. Khati NJ, Glanc P, Bhosale PR, et al. ACR Appropriateness Criteria® Abnormal Vaginal Bleeding. American College of Radiology. Available at https://acsearch.acr.org/docs/69458/Narrative/. 2014; Accessed: October 2, 1018. Di Donato N, Bertoldo V, Montanari G, Zannoni L, Caprara G, Seracchioli R. Question mark form of uterus: a simple sonographic sign associated with the presence of adenomyosis. Ultrasound Obstet Gynecol. 2015 Jul. 46 (1):126-7. [Medline]. [Full Text]. Chiang CH, Chang MY, Hsu JJ, et al. Tumor vascular pattern and blood flow impedance in the differential diagnosis of leiomyoma and adenomyosis by color Doppler sonography. J Assist Reprod Genet. 1999 May. 16(5):268-75. [Medline]. Di Spiezio Sardo A, Calagna G, Santangelo F, Zizolfi B, Tanos V, Perino A, et al. The Role of Hysteroscopy in the Diagnosis and Treatment of Adenomyosis. Biomed Res Int. 2017. 2017:2518396. [Medline]. [Full Text].